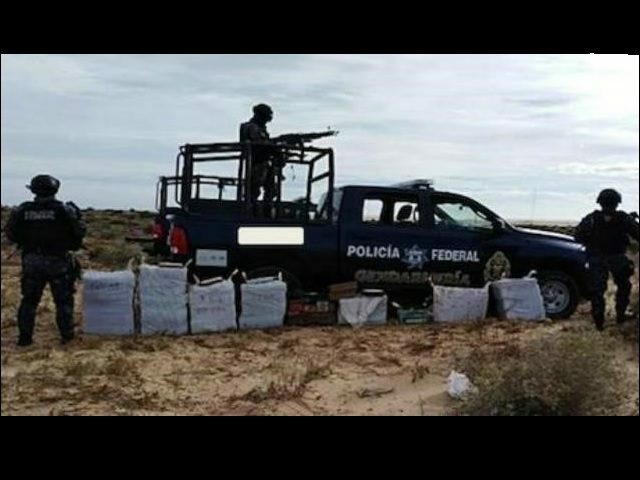 Mexican federal police in the border state of Sonora seized over 550 pounds of methamphetamine, heroin, and fentanyl in a truck that was abandoned by smugglers after a pursuit over the recent weekend. The occupants were able to flee on foot. The incident occurred when Federal Police were patrolling along the highway located between San Luis Río Colorado and the Golfo de Santa Clara, approximately 20 miles from the U.S. border with Arizona. The patrol came upon a truck, which fled in close proximity to authorities. After a pursuit, the passengers abandoned the vehicle and avoided capture. A search produced approximately 530 pounds of methamphetamine wrapped in 235 individual plastic containers; 13 pounds of heroin; and nine pounds of fentanyl. The matter was turned over to the federal attorney general’s office, according to local reporting. The Federal Police patrol is part of an environmental mission in the Upper Gulf of California to combat the illegal trafficking of the endangered totoaba fish, which is native to the area. Organized criminal elements have recently developed interests in illegal fishing operations. Mexican authorities and U.S. counterparts continue to make large seizures of methamphetamine along the California and Arizona border. According to Breitbart law enforcement sources, most seizures are the result of the Sinaloa Cartel’s escalated production with “super labs.” Sources say the cartel boosted production of methamphetamine and opioid-based products to offset any cash flow losses attributed to the growing legalization of marijuana in the United States.